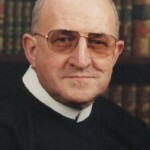 The Redemptorist Community is sad to announce the death of our brother, Fr Louis. Fr Louis died peacefully today 30th November in Blackrock Abbey Nursing Home, accompanied by his family and confrères. We thank all the medical and care staff who took such great care of Fr Louis, as well as all those who faithfully visited him. May he rest in peace. Reposing in St Gerard’s Hall from 12 noon to 5:30pm on Friday 1st December, followed by transfer to St Joseph’s Church. Funeral Mass will take place at 11am on Saturday 2nd December, followed by burial in the Redemptorist Community plot in St Patrick’s cemetery, Dowdallshill.